Eric Fisher has unearthed and scanned proto-BART plans from 1956. 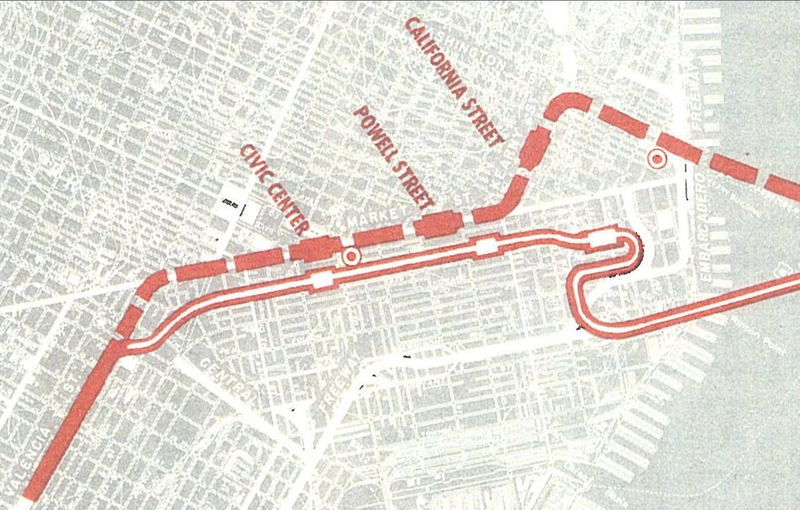 Some fascinating detail, including a Marin line routing along Kearny, Columbus and down Lombard (instead of Geary in later not-to-be plans). Various alternatives were presented. One included underground stations for the Marin line at Lombard & Van Ness, with a tunnel under Russian hill to Columbus & Green, and a terminus at California & Kearny. Both elevated and suspended trains were considered. A few different options were proposed for downtown. One was a tunnel from the East Bay meeting with the Marin terminus at California, dodging over to Market as we know today, then continuing down Valencia. The alternative would have come in from the East Bay over the Bay Bridge and run above Mission (with stops at 4th and 8th). The Peninsula line would have dangled above Valencia (with stops at 14th and 22nd), then cut down Tiffany Ave to a tunnel at Dolores & San Jose, exiting around Bosworth, with a station at Ocean. The plans show the line continuing south down the Peninsula to Palo Alto with a maintenance yard at Arastradero. All sorts of crazy detailed suggestions for Marin, and past Palo Alto to Santa Clara / San Jose / Los Gatos (no 280 or 880 yet!) More can be seen on this system-wide map and the rest of the detailed maps on Eric’s Flickr stream. I don’t know which is more entertaining, that 1970 Basta Ya! article, or this 1973 Bay Guardian article on the dangers of Bechtel over on FoundSF. it’s a pretty fascinating document to look over and compare to what was actually built. And when Ian says oversize, he really means oversize! It is an insanely unwieldy book — something like 17″x44″, which is why the scans are kind of a mess. I always thought the real sweet spot for an additional city transit option would be a spectacular Gondola system. With a main hub up on Mt. Sutro and some lines that swung down into the Mission, Sunset, the Park, Downtown, and hell while you’re at it might as connect to an additional station on top of Potrero.